With wit and wisdom, Nicole Johnson leads readers in a journey of awakenings. Living a fresh-brewed life requires that women encounter a beautiful awakening in three areas. First, to God as they respond to His tender, passionate love for them; second to themselves as they embrace their identities as women, their gifts, and their dreams; and third to others as they learn to love and communicate in ways that bring joy and closeness. 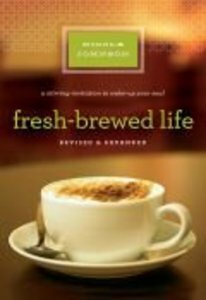 In this substantial revision-including new chapters and a study guide-of the successful 1999 "Fresh-Brewed Life, "Nicole offers a freshly brewed, wake-up-and-smell-the-coffee guide to living life to the fullest. She encourages Christian women to recognize the areas in their lives where they are sound asleep-and let God wake them up again. Readers will find a heartwarming, honest book that's good to the last drop. Do you need hope for the daily grind? Are your responsibilities and commitments robbing your life of joy? Are you sleepwalking through your days? Are you on the sidelines of your life as a spectator instead of fully participating? This is your wake-up call to a Fresh-Brewed Life. Nicole Johnson invites us to wake up to a richer, fuller, more flavorful life than we ever imagined. In a robust blend of relationship, ritual, and hope, we are summoned on a journey of discovery that awakens us to God to ourselves, and to others. And- like lingering over a cup of coffee- this is a process to be savored. Since first published ten years ago, Fresh-Brewed Life has helped more than 100,000 women wake up their souls. Now revised and expanded with additional chapters, more journaling ideas and fresh-brewed adventures, and a brand new discussion guide, Fresh-Brewed Life will help start brewing your own, richer, more meaningful life. Nicole Johnson is an actor, sought-after speaker, and popular author. She lives in Santa Monica, California.